Just a set of bones, but a very important set at that! For this is Perak man. 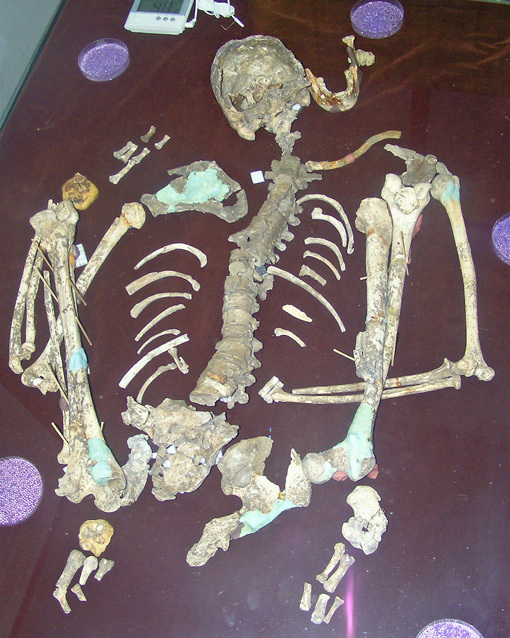 The oldest skeleton found in the Peninsula so far. He is believed to be a male (but the experts are not absolutely sure) with a height of approximately 157cm, aged about 45. It was discovered in 1991 and the skeleton has been dated to around 11,000 years old. There were two significant facts about thisskeleton. The first was that he had a malformed left hand, meaning his left arm and hand were much smaller compared to his right arm and hand. This deformity could be from a genetic disorder known as ‘brachymesophalangia’. This evidence is further supported by the fact that his spine is curved towards the right due to living with only one good hand. The second interesting fact about the Perak Man was that despite his handicap, he lived to be about 45. This is considered a ripe old age for his time period. And especially when you consider that he might have been a hunter-gatherer, with only one good hand you can’t really hunt or gather very well and so living to 45 with that kind of handicap is pretty exceptional. Why not drop in to Lenggong and say hello to him sometime! I’d like to pay a visit to Lenggong museum soon to pay a visit to our ancestor. Anyone care to join me?